I was privileged to be able to attend the 2016 Mid Year meeting of the Catholic Medical Association last month in Mundelein, Illinois. A full schedule of meetings, daily Mass and social gatherings made the 3 days pass quite quickly. A major focus of the meeting was developing the communication skills of those in attendance. Workshops were offered in public speaking and web site development. Other speakers modeled optimal interaction with political leadership. We heard several presentations from successful Guild chapters, demonstrating strategies to grow a healthy Guild chapter at home. Sr. Mary Diana Dreger, OP, MD gave an excellent talk entitled, “Conscience: At the End of the Day”, which explored the practice of Medicine as a moral endeavor. Our Chaplain, Father Matthew Gutowski was in attendance throughout, saying daily Mass and offering evening spiritual reflections. Participating in such a faith filled environment was a great comfort. Meals and session breaks provided opportunities to get to know the other members of the CMA from around the country. I was especially pleased to meet the current Presidents of the Buffalo and Syracuse Guilds. There is potential to work together on issues affecting our State and even cosponsored events. On Saturday evening we saw a screening of a new documentary, “Hush”, which explored the strong connection between pregnancy termination and breast cancer. It was an enlightening film, and remarkable as it was written by a pro-choice individual. The CMA is holding their annual meeting this October in Washington, D.C. I know many of our local Guild members will be in attendance. Perhaps you can break away for a few days to attend as well. I am confident you will find it to be most rewarding. A warm summer’s evening several weeks ago greeted those who attended the summer soirée of the Finger Lakes Guild. Hosted by retiring Guild President, Dr. Elissa Speach, and her husband, David, some 50 people enjoyed the pleasant outdoor setting at their home. While all enjoyed the warm breezes and delightful foods, a shared sense of values and purpose was the main attraction of the event. 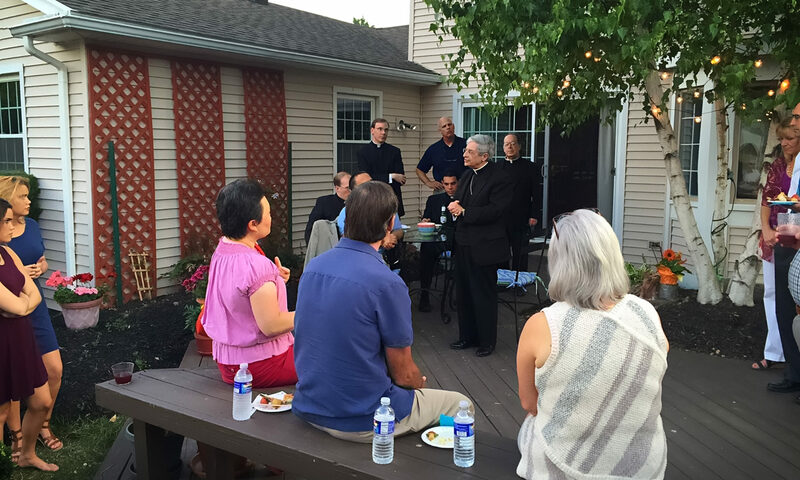 We were delighted that Bishop Salvatore Matano was in attendance, and true to form, he shared his counsel and support of our Catholic mission in this most troubled world. Many other clergy were in attendance, as well, demonstrating the Diocese’s commitment to our Guild. Dr. Speech expressed her appreciation for the service and dedication of the other retiring Guild officers, namely Dr. Phil Murphy (Vice President) and Dr. Karen Dalton (Treasurer). In turn, incoming President Dr. Rick Seeger recognized all of our retiring Officers and introduced our new Vice President, Dr. Ellen Dailor and Treasurer, Dr. Mike Martin. Jean Parker will continue as Secretary, pending a new candidate for that position.